In the second phase of the Food Matters campaign, the NFWI is launching a national discussion on the issue of food poverty. We have produced a toolkit for WIs and Federations to take part by organising local events and taking action. You can download this now. We are conducting a poll exploring the extent to which WI members and the public donate to food banks and other community food aid organisations. Whether or not you have donated to a food aid organisation in the past, we would like to hear from you. The poll takes no more than two minutes to complete and is open to the public, so please do share among your networks. Sign up to receive the toolkit. People in communities across the UK are going hungry. Some have to rely on emergency food parcels from food banks to feed themselves and their families. At present, too many have to choose whether to skip a meal or turn off the heating. Children and young people aren’t eating enough good food during the school summer holidays, causing them to fall back in educational attainment. Since its earliest days, the Women’s Institute movement has been at the forefront of debate about our food system. The supply of food to the war-torn nation was central to the early activities of the growing WI movement in Britain. Since then the challenges of ensuring a sustainable food supply, tackling poverty and protecting our environment have remained key to our heritage and close to members’ hearts. 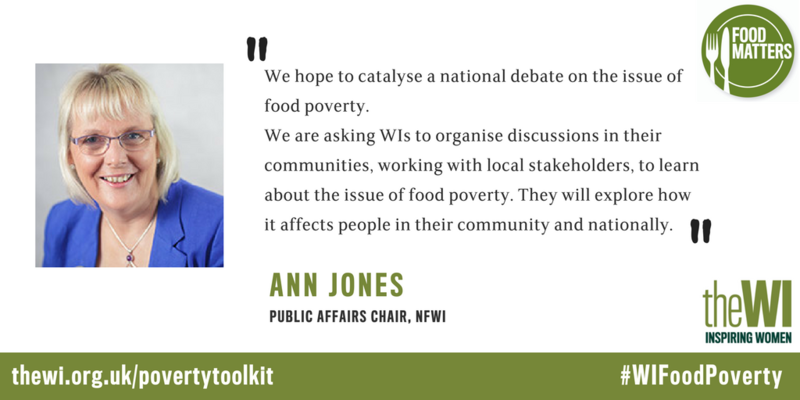 To help tackle the current issue of food poverty, which is affecting communities across England, Wales and the Islands, we’re calling on WIs and Federations to host a Food Poverty Debate in their own area. This is the next stage in our Food Matters campaign, which aims to tackle food waste and food poverty. The Public Affairs team has produced a toolkit to tell you what you need to know about food poverty, to guide you through organising a debate, and to help you take action to tackle the problem in your community. This work follows on from the pioneering Great Food Debates project, which saw WIs and federations organise more than 100 discussion events to consider food security. Greater public engagement in these issues is vital if we are to secure sustainable and affordable food for all. As an educational charity, the WI can play a key role in helping communities learn more about this issue and consider what action needs to be taken at a local and national level. Sign up now to receive the toolkit.